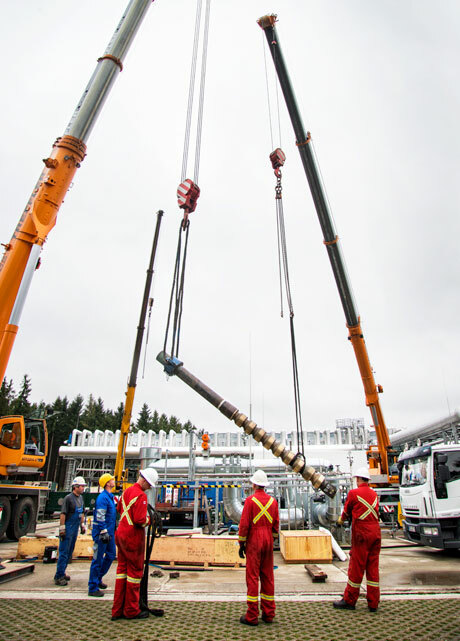 By bringing together a highly experienced team with leading edge manufacturing and a deep commitment to customer service, Canadian Advanced ESP is able to deliver superior high pressure pump applications and Variable Frequency Drive Systems to the global oil and gas industry. Located in the heart of Canada’s energy sector, our focus is on Electric Submersible Pump Systems for Artificial Lift applications, Horizontal Pump Systems for a variety of high pressure applications and innovative Variable Frequency Drive Systems. Operating sophisticated production processes in challenging conditions, extreme climates and remote locations requires reliable pumping systems. Canadian Advanced ESP pumping systems are the industry choice, producing more flow, more head, greater efficiency and wider operating ranges than most competitor’s offerings. Canadian Advanced ESP creates high quality, innovative, safe and environmentally sound solutions by applying advanced technologies, strict quality management and superior engineering capabilities. Our detailed process and application knowledge has allowed us to develop several patented engineering solutions as well as custom design systems when required. All Canadian Advanced ESP operations are certified to ISO 9001:2015, ISO 14001:2015 and OHSAS 18001:2007 standards to ensure the highest quality products with the greatest value for customers worldwide. Quality assurance begins with a contract review and continues throughout the entire process. All products are inspected and performance tested in line with relevant API and other specification criteria before leaving the factory. The long-term success of any pumping system depends upon the quality and availability of customer support services. Canadian Advanced ESP prides itself on providing fast and efficient response to any situation, without compromising quality. Our field technicians will install, commission and monitor the pumping system to ensure successful operation. The crews are equipped with state-of-the-art tooling and modern truck mounted spooling units for all cable spooling and banding needs. Canadian Advanced ESP service centres, strategically located across the globe, offer our customers easy access to a full range of repair and maintenance services including unit installation, troubleshooting and preventive maintenance. In addition to supplying parts and services for all of our equipment, Canadian Advanced ESP’s in-house re-engineering specialists will design, deliver and fit high integrity components for other manufacturer’s machinery – including upgrading and retrofitting existing pump installations. Using root-cause failure analysis, system investigation and material assessment, Canadian Advanced ESP can modify existing installations to meet new duty conditions, improve operating efficiencies and increase MTBF. Canadian Advanced ESP also provides all the accessories needed during installation and maintenance of Electric Submersible Pumps and Horizontal Pump Systems including bleeder valves, check valves, banding materials, MONEL bolting and couplings, as well as flat cable extensions for most designs used in the industry. At Canadian Advanced ESP, we constantly strive to improve our customer service performance and deliver the highest possible life cycle value in the industry. Canadian Advanced was founded in 1999 and is the only independent Manufacturing Company in this field in Canada. Our headquarters and the main manufacturing facility is based in Edmonton, Alberta, Canada.